i love these two bouquets i found on oncewed.com. they are right up my alley. 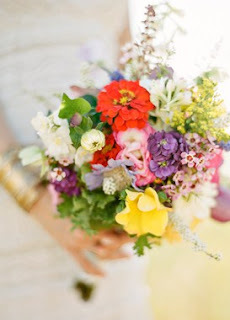 bright colorful wildflowers paired with the soft, light pink bunches of ranunculus and roses. by the way, i tried to grow wildflowers in the front of my house and a bunny or another animal ate the seedlings! argh! so i'm totally jealous of the blooms above... oh well!